When the wild winds started blowing at a skate park in Fairfield Tuesday afternoon, Orlando Rosario and his friends ran for their lives. Terry McSweeney and Rob Mayeda report. When the wild winds started blowing at a skate park in Fairfield, California, Tuesday afternoon, Orlando Rosario and his friends ran for their lives. The whirlwind that struck Allan Witt Park whipped up debris and tore off parts of a structure's roof, sending people rushing for cover. Fortunately, no one was injured. "All of a sudden everything started coming off the roof and flying everywhere," Rosario said. 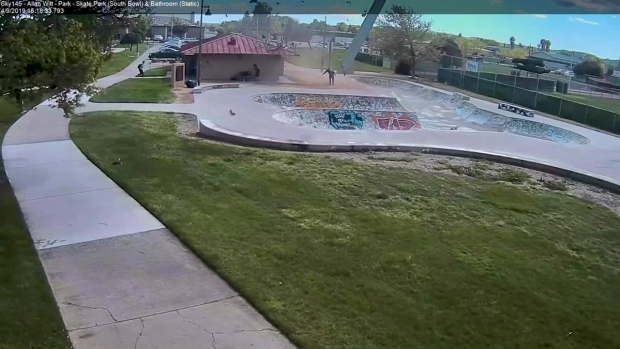 The wild wind event — referred to as a dust devil — was caught on camera by several witnesses as well as the City of Fairfield's camera at the park. Video captured what appeared to be skateboards being picked up by the howling gusts and launched across the pavement. One person struggling to keep their footing was even spotted twirling in the whirlwind as it ripped off roofing material from a building at the park. Courtney Vann, a 6th grade teacher at a middle school across the street, said she thought the strong wind was a tornado. "I was over here coaching soccer with my girls team and we heard a loud sound," Vann said. "After about 10 seconds, I said to myself, 'I am pretty sure that is an actual tornado,' and I started thinking, 'What if those metal pieces come towards us?' So we actually started running for cover." While some witnesses suspected a tornado, NBC Bay Area Meteorologist Rob Mayeda said there didn't appear to be a cloud-to-ground connection or a storm strong enough to create a funnel. A dust devil is a small, rapidly rotating wind that is made visible by dust, hence its name. The whirlwind usually develops when conditions are clear, dry and hot, according to the National Weather Service.